Mexican food is one of those things that can be really simple, or so insanely complicated that it saps your life force away. Years ago I made a chicken mole that defied logic, had 75 ingredients and took two days to make, it was absolutely delicious and I’ll most likely never make it again. Well, maybe. No. No no no no. It took about 6 hours, 7 if you count the time it took to make the back ups. 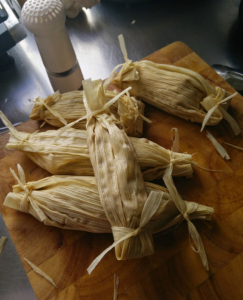 It turns out, corn husks are really hard to use as wrapping, even once soaked. I substituted baking paper for the leftovers and they worked out really well, so if I ever make these again, I’ll only use baking paper. A stove top steamer with basket and lid. I don’t have this, so I used a soup pot, colander and extra frypan as a lid. Mkay. So, whack the meat, stock and herbs into a slow cooker and cook on low till you can shred the pork. Reserve the liquid, blend smooth if it’s a bit chunky, however the chillis and garlic should basically dissolve. Add the chilli sauce and maple syrup to taste. Blend your flours in a large bowl and pour in the broth til you get a thick dough. I had mine at scone consistency, but some recipes called for it to be firm, so you can roll it out. I’ll try that next time, but this worked just as well. Spread the dough over about half of a corn husk, thinly. 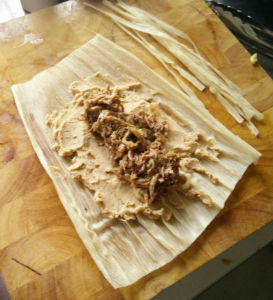 Spoon the meat into the middle and then roll up, fold the ends and tie with a bit of corn husk, or use kitchen string. 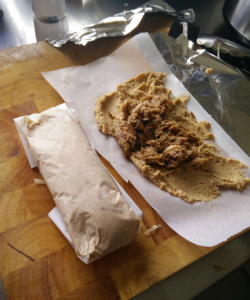 For my baking paper efforts, it simply stuck together so you just fold it like a burrito. 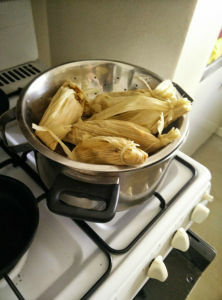 Have the water in your steamer boiling, place the folded tamales inside the basket –they say all standing up, but if you don’t have enough of them, just lean them against the side. I had to pile mine on, but meh, it was good enough. 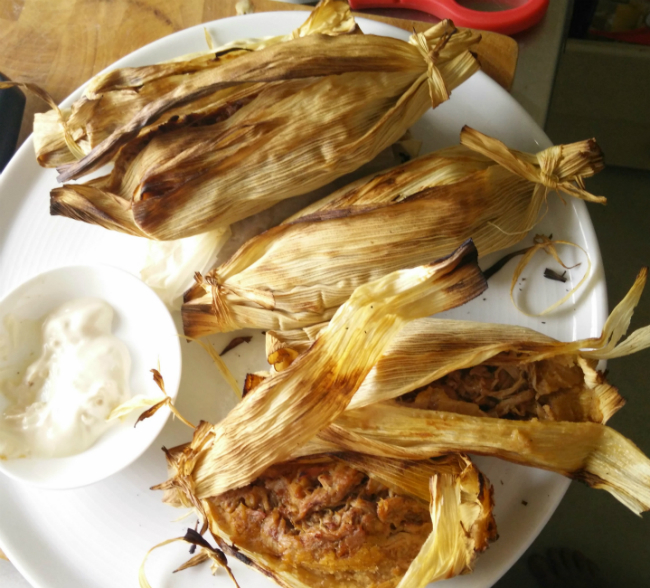 I found that even after 45mins, the dough wasn’t firm enough, and the corn husk smelled weird, so I put them in the oven for 10 mins to char the outside of the husks, looks great for presentation. Eat with sour cream, or more chilli sauce if you want more of a kick.